The adoption of fast fashion has had disruptive effects on environmental, social and behavioural factors globally. The drastic increase to the environmental impacts of textile waste and fast fashion consumption urgently need to be addressed. The fundamentals of our global/economic fashion industry need to be restructured beginning with the destructive nature of our current mainstream relationship to clothing. This dynamic has significant consequences. Fashion consumption has become a passive act, and we no longer care for the longevity of our clothing. Clothing is often disposed long before it reaches its expected life. The negative impacts of textile and fashion industry from environmental aspects are far greater than what it could be seen on the surface. From the 500,000 toxic nano-fibres that are released into water every time we wash our clothes, to the enormous carbon emissions emitted through both the production and disposal of our clothing, fashion has become a compromise that comes at a huge human, social, and environmental cost. What if clothes were alive and photosynthesized? In order to tackle this complex issue, Materials Experience Lab’s researcher Roya Aghighi is exploring the potential of Living Textiles for futures of clothing and product design. Investigating if designing with living organisms can bring the agency back to textiles, and how it would change our relationship to our clothing—the way we experience and interact with our clothes. In pursuing this matter, her current project Biogarmentry found a special condition in clothing that users will connect to—a living textile that is capable of photosynthesis. Biogarmentry is a transdisciplinary collaboration between nature, design and science. In this process the living organisms of algae are the essential part of the design process in order to create the first living and photosynthesizing textile. 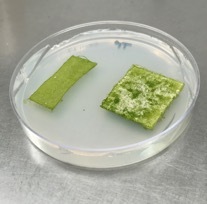 As a unique approach to this project, biological manufacturers replace industrial ones, and living organisms are designed to be the textile itself while remain alive over the utilization period. The material will work-while living-to purify the air through photosynthesis. Thus, by simply being present in the environment, consumers can reduce some of the harm they cause to the environment. Biogarmentry stresses on the importance of care in both fashion production and consumption to reconnect users with their clothes. Seeking alternative systems for current textile industry, Biogarmentry ultimately encourages a shift from traditional models of buy, use, and dispose to buy, care, and compost. Since the lifecycle of the living photosynthetic textile is directly dependent on how it is taken care of, caring for clothes would regain ascendance as a crucial part of the system, encouraging users to actively embrace habits that work to support their living textile to flourish. Further improvement of this project will be conducted in collaboration with a new BioDesign Lab of Avans University of Applied Sciences.